To Cite: Akhondzadeh K, Najafi Ghezeljeh T, Haghani H. The Effect of the Education Program on the Adherence Intention to the Dietary Sodium Restriction and the Amount of Sodium Intake in Patients With Chronic Heart Failure, Iran Red Crescent Med J. 2018 ; 20(S1):e12925. doi: 10.5812/ircmj.12925. Background: High sodium intake can increase the symptoms of patients with chronic heart failure. Objectives: To examine the effect of the education program on the adherence intention to the dietary sodium restriction and sodium intake in patients with chronic heart failure hospitalized in a teaching hospital affiliated with Yazd University of medical sciences, Yazd, Iran from January to July 2016. Methods: This controlled randomized clinical trial was conducted on 100 patients suffering from chronic heart failure. Block randomization was used to assign the patients to the intervention and control groups. In addition to routine education, the patients in the intervention group and one of their family members participated in the education program for 6 consecutive weeks. The amount of sodium intake in a 24-hour period was measured. A urine sample was collected for the measurement of the secondary outcome. A questionnaire was used for data collection about the evaluation of the adherence intention to the dietary sodium restriction. Results: There were statistically significant differences between the intervention (2539.40 ± 1130.03) and control (3016.80 ± 790.38) groups in terms of the sodium intake 6 weeks after the intervention (P = 0.0023). Also, statistically significant differences were reported between these groups (2601.84 ± 1128.43 and 3041.95 ± 789.75 in the intervention and control group, respectively, P = 0.036) 12 weeks after the intervention. Six and 12 weeks after the education program, statistically significant differences were found between the groups in terms of the attitude (P < 0.001), subjective norm toward the restricted-sodium diet (P < 0.001), and perceived behavioral control (P < 0.001). Conclusions: The education program promoted the adherence intention to the dietary sodium restriction among patients with chronic heart failure, which subsequently led to the sodium intake reduction. Non-communicable diseases are the leading cause of death. It is estimated that 35 million out of 53 million deaths occurred in 2010 due to non-communicable diseases (1). Despite decades of decline in cardiovascular diseases in the western countries, they remain the leading cause of death across the globe (2). For instance, about 23 million people in the world are estimated to have chronic heart failure, and 1 out of 5 people are at the risk of heart failure (3). A 40-year-old person has an estimated 20% chance of heart failure. Also, 1 million people are hospitalized in Europe every year due to heart failure (4). A cross-sectional study carried out in 29 provinces of Iran showed that 46.44% of total deaths between 2006 and 2010 were from cardiovascular diseases including chronic heart failure (CHF) (5). CHF is a clinical syndrome in patients with inherited or acquired cardiac disorders that causes a series of clinical symptoms (6). It is the leading cause of hospitalization in people over the age of 65 years (7). Non-compliance with the therapeutic regime, non-adherence to diet, and lack of knowledge about the deterioration of signs and symptoms are the main causes of hospitalization (8). Due to the use of diuretics, patients with CHF should be faced with the reduction of sodium and potassium in the serum, a lack of compliance with the low-salt diet, and not taking diuretics according to the physician's instructions causes the high amounts of sodium and potassium in these patients (9). One of the main causes of readmission to the hospital among patients with CHF is an increase in fluid and sodium intake. Treatment goals in symptomatic patients are the reduction of fluid retention, increase of patients’ self-care abilities, and prevention of the disease’s progression (6). There is an association between the sodium intake and the increased risk of cardiovascular diseases (10). A reduction of the average daily sodium intake to 400 mg can significantly improve the patients’ health condition (11). In patients with CHF, nutritional guidelines are usually less adhered than therapeutic regimes (12). A reason for a non-adherence to the therapeutic regime is a lack of awareness about CHF and its control (13). The patients’ compliance to the therapeutic regime can be increased if patients receive appropriate education (14). Also, social factors in the patients’ life, including social and family support, can significantly affect the patients’ adherence to the therapeutic regime. The family plays a key role in the provision of support to patients during disease management (15). While the number of patients with CHF has increased, they have little knowledge about the disease. Since, there is no definitive treatment for CHF, an increase in the patient’s survival rate depends on preventive measures and proper education (16). Nutrition is an important aspect of health and an important environmental factor influencing patients’ health. It can prevent the occurrence of many diseases in the community. Limiting the sodium intake is one of the easiest, most effective, and cost-effective ways to reduce the burden of cardiovascular diseases in the society (17). If the average of daily sodium intake is reduced to about 400 mg, it can significantly improve the health of patients (11). A study conducted in the USA showed that a 10% reduction in salt intake prevented death from stroke and heart attack among 45-80-year old adults and saved $32 billion in health spending (18). Since sodium consumption has a direct relationship with fluid retention, adherence to a low sodium diet can play a key role in controlling this disease (19). The theory of planned behavior (TPB) predicts one’s intention to perform a behavior and the occurrence of a behavior in the future (20). Intention to perform a behavior is predicted by the following components, such as the person has a positive perspective toward performing the behavior (attitude), the person feels being under the influence of the social pressure to perform a certain behavior (subjective norm), and the person believes in his/her ability to perform the behavior (perceived behavioral control). According to the TPB model, the positive attitude towards performing the action, ideal subjective norm, and high-perceived behavioral control are the predictors of performing and adhering to the behavior (21). A review of 22 studies showed a moderate to severe association between the constructs of the behavioral intention and adherence to dietary patterns (22). A study demonstrated that the attitude, subjective norm, and perceived behavioral control were the significant predictors of the intention of women with HIV toward the use of dietary supplements (23). Also, significant differences were observed in terms of the behavioral intention and its subscales as well as the belief in the use of supplements between users and non-users. According to the TPB, health-related beliefs impact the behavioral intention and can affect the person’s actual behavior (20). Given the weakness of adherence to the low sodium diet in patients with CHF and the importance of increasing their adherence to the low sodium diet, this study examined the effect of the education program on the adherence intention to the dietary sodium restriction and sodium intake among patients with CHF. This randomized controlled clinical trial was conducted with patients suffering from CHF hospitalized in a referral teaching hospital affiliated with a medical sciences university in an urban area of Iran from January to July 2016. A convenience sampling method was used for recruiting the patients using the following inclusion criteria: aged 18 years or older, diagnosed with CHF by a cardiologist, no-acute cardiac conditions, able to communicate and write in Farsi, no sensory perceptual problems, no kidney failure, and living with a family member such as the spouse and children. In the intervention group, those patients who failed to attend even 1 of the education sessions were excluded from the study. In both groups, those who were not willing to continue participation in the study or experienced a deterioration in their healh conditions were excluded from the study. A block randomization of the size 4 was used to allocate the patients to the intervention and control groups. Various possible modes of assignments to the groups were written on cards and placed in opaque and sealed envelopes in a box. One of the staff nurses who was unaware of the study process pulled 1 pocket out of the box to determine the groups’ assignment, under which every 4 patients were listed for entering the study. This process was continued until the required number of the patients was recruited. The blinding process was executed for those co-researchers who were responsible for data collection and analysis. The patients in the control group received routine education. In addition to routine education, the patients in the intervention group received an education program within 6 consecutive weeks (1 session in each week). The details of the education program were summarized in Table 1. The education program was conducted by an educator as the co-researcher under the supervision of the principal researcher and a cardiologist. In the education program, lectures were presented to small groups of 6 - 8 patients and a family member in the hospital. The patients were requested to make phone calls to the researcher to answer their possible questions and follow up their adherence to the dietary sodium restriction. Moreover, they were given a diet manual consisting of information about CHF, its symptoms, the treatment process, recommended amount of sodium intake, amount of sodium in different foods, and cooking methods. 1st Patients and one family member Individual 15 - 20 minutes Introduction, filling out the data collection forms, providing information about the schedule of education sessions and planning for the next education session. 2nd Patients and one family member Group education program 45 - 60 minutes Providing information about the outcomes of an adherence to the dietary sodium restriction, pathophysiology of CHF, and the negative consequences and the effects of high sodium intake and increased fluid volume. 3rd Patients Telephone call 10 - 15 minutes Providing answers to questions, encouraging the patients to adhere to the restricted-sodium diet, requesting the patients to attend the next education session. 4th Patients and one family member Group education program 45 - 60 minutes Providing a review on the principles of the adherence to the restricted-sodium diet, different ways for flavoring food, identification of foods with low or high sodium levels, methods to choose proper food inside and outside home and provision of a diet manual. 5th Patients Telephone call 10 - 15 minutes Providing answers to questions, encouraging patients to adhere to the restricted-sodium diet and requesting the patients to attend the next education session. 6th Patients and one family member Group education program 30 - 45 minutes Providing a review on the principles of adherence to the restricted-sodium diet, sharing the patients’ experiences about the diet restriction and giving feedbacks. The disease and demographic information questionnaire, the sodium intake form with information based on a 24 - hour urine sample, and the dietary sodium restriction questionnaire (DSRQ) were used for data collection. The DSRQ was developed and used to evaluate the adherence intention to the dietary sodium restriction in patients with CHF before the intervention and 6 and 12 weeks after the intervention (24). This instrument consisted of 16 questions and 3 subscales as follow: attitude, subjective norm, and perceived behavioral control. The higher score in the DSRQ on the attitude (with the overall score of 6 - 30) and subjective norm (with the overall score of 3 - 15) subscales represented the higher levels of the construct being assessed. However, a lower score in the perceived behavioral control (with the overall score of 7 - 35) subscale indicated more perceived control of the behavior. The DSRQ was translated to Farsi by 2 translators who were familiar with medical terminology and 1 bilingual translator. Following the consensus of the translators, the Farsi version of the DSRQ was back translated to English by 2 bilingual translators who were not aware of the content of the original questionnaire. Next, in a meeting in the presence of the translators and researchers, the Farsi and English versions were compared with the original one and a consensus on the content of DSRQ was achieved. The content validity of the Farsi version of the DSRQ was checked by an expert panel. To examine its face validity, the DSRQ was assessed by 10 patients with CHF who were similar to the samples taken in the study. The patients were interviewed individually lasting for 10 to 15 minutes. They acknowledged the validity, clarity, and comprehensiveness of the DSRQ. Finally, the DSRQ was administered to 30 patients with CHF twice with a 1 week interval. The Cronbach's alpha coefficients for the attitude, subjective norm, and perceived behavioral control were reported as 0.84, 0.72, and 0.82, respectively. The Pearson correlation coefficient for the attitude, subjective norm, and perceived behavioral control were stated as 0.72, 0.69, and 0.64, respectively, which confirmed the reliability of the DSRQ. All patients in both groups were requested to complete the DSRQ before the intervention and at 6 and 12 weeks after the intervention. The amount of sodium intake as the secondary outcome of this study was measured at the beginning of the study as well as 6 and 12 weeks after the intervention through collecting a 24-hour urine specimen. The data was recorded in the sodium intake form. To obtain a urine sample, the patients were requested to collect all urine, starting from the second urine sample in the morning of the collection day and finishing with the first urine sample from the next day. In accordance with the standard procedure, the amount of urinary sodium was measured using the flame photometry method (FPM) in the laboratory of the hospital. To assess the validity of the specimen’s collection, the 24 - hour urinary excretion of creatinine was measured by using the Jaffe method. The 24 - hour urine sample was considered unacceptable if the urine creatinine level was lower than 4 mmol/dl for the women and lower than 6 mmol/dl for the men. In this study, all samples were collected accurately and no patient was excluded from the study. For the calculation of the sample size, using the following formula and the confidence level = 95%, statistical power = 80%, standard deviation = 6.5, and assuming the difference between the effect of education on the behavioral intention toward an adherence to the dietary sodium restriction with a minimum significant score = 4 led to the determination of 42 patients in each group. Moreover, the probability of 25% sample loss for each group increased the sample size to 50 patients in each group. However, in the intervention group 2 patients were excluded due to the deterioration of their disease status. Also, 4 more patients were excluded due to not attending all the education sessions. Similarly, in the control group 5 patients left the study due to unwillingness. Therefore, data analysis was performed on data collected from 44 patients in the intervention and control groups (Figure 1). Descriptive and inferential statistics via the SPSS v.16 was used for data analysis. The significance level was set at P < 0.05. The normality of variables was checked using the Kolmogorov-Smirnov test and all variables had a normal distribution. For quantitative variables, the independent t-test was used to compare the groups before as well as 6 and 12 weeks after the intervention. The Chi-square test and Fisher’s exact test were run for analyzing qualitative variables. Moreover, the repeated measure analysis of variance (ANOVA) was used to compare the changes in the mean of the quantitative variables at the measured intervals in each group. ‏The effect sizes for the post-test values of the study variables were also calculated by using Cohen’s d‏. Permissions were obtained from the Ethics Committee (94.d.1.105.1721, date: June 2015) and the research council affiliated with Iran University of Medical Sciences, Tehran, Iran. Also, the protocol of this study was registered at the website of clinical trials (IRCT2015061222667N1). In addition, the permission to enter the research zone was obtained from the authorities at Yazd University of Medical Sciences, Yazd, Iran. The researcher (KA) explained the aim and method of the research to patients. They were assured about anonymity and the confidentiality of their information. Also, participation in this study was voluntary. Those who agreed to willingly take part in this study signed the written informed consent form. After finishing data collection, the educational materials given to the patients in the intervention group were also shared with the patients in the control group. The patients in both groups were homogeneous in terms of disease and demographic characteristics. The patients mostly were married, housewives, or retired. The educational status of the patients was under a high school diploma with an income almost adequate to cover their living expenses. The majority of the patients in both groups were living with their spouses and children. Most patients in both groups were taking furosemide. The cause of heart failure for more than 60% of patients in this study wer ischemic heart diseases (Table 2). Also, before the intervention, there was no significant differences between the groups in terms of the systolic (PP = 0.715) and diastole (P = 0.643) blood pressure (Table 2). Six weeks after the intervention, 2 groups did not have a statistically significant difference in systolic blood pressure (P = 0.605), however, their diastolic blood pressure had a significant difference (P = 0.029), therefore, the mean diastolic blood pressure in the control group was more than the intervention group. Twelve weeks after education, 2 groups had statistically significant differences in systolic blood pressure (P = 0.019) and diastolic blood pressure (P < 0.001). Twelve weeks after education, the means of systolic and diastolic blood pressure were higher in the control group (Table 2). Abbreviations: EF, Ejection fraction; BMI, Body mass index; SD, Standard deviation; F, Frequency. No statistically significant differences were observed between the groups before the intervention with regard to the mean scores of the attitude, subjective norm, and perceived behavioral control. Six weeks after the education program, statistically significant differences were found between the 2 groups in terms of the attitude (P < 0.001), subjective norm toward the restricted-sodium diet (P < 0.001), and perceived behavioral control (P < 0.001). In addition, 12 weeks after the education program, statistically significant differences were found between the groups in terms of attitude (P < 0.001), subjective norm toward the restricted-sodium diet (P < 0.001), and perceived behavioral control (P < 0.001). Also, 6 and 12 weeks after the intervention, the effect size of the education program was large in the 3 subscales (Table 3). Moreover, the repeated measure ANOVA test demonstrated that the mean scores of the attitude, subjective norm, and perceived behavioral control toward adherence to the dietary sodium restriction were significantly different over time in the intervention group. No such differences were reported in the control group (Table 3). According to the Bonferroni post hoc test, in the intervention group, the mean scores of all subscales of the adherence intention to the dietary sodium restriction showed statistically significant differences before the intervention and 6 and 12 weeks after the education program (P < 0.001). However, 6 and 12 weeks after the education program, no statistically significant differences were observed in the mean scores of all subscales. There was no statistically significant difference between the groups before the education program in terms of the average of sodium intake (Table 3). The mean score of sodium intake for all patients was 3142.04 (SD = 1179.56) with a range of 1245 - 6521. Six and 12 weeks after the education program, the groups were significantly different in terms of sodium intake. In the intervention group, sodium intake was less than that in the control group. 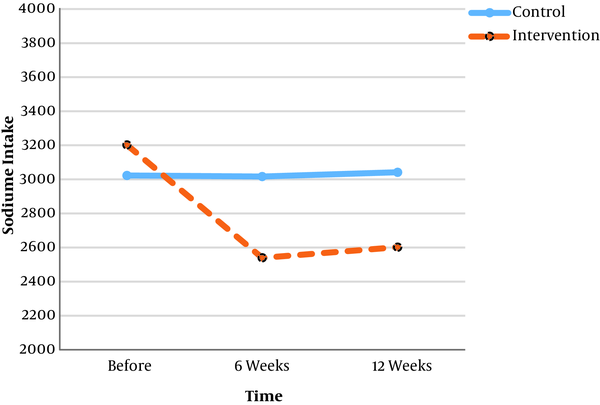 Moreover, the effect size of the education program on the patients’ sodium intake was medium, indicating a reduction 12 weeks after the education program (less than 0.5). The repeated measure ANOVA test showed that the mean scores of the sodium intake had statistically significant differences in the intervention group. However, in the control group this difference was not statistically significant. According to the Bonferroni post hoc test, the mean scores of the sodium intake had statistically significant differences before the intervention as well as 6 and 12 weeks after the education program (P < 0.001). Moreover, the mean score of the sodium intake had a statistically significant difference 6 and 12 weeks after the education program, which was lower 6 weeks after the education program (Figure 2). The study showed that the education program had a positive impact on the adherence intention to the dietary sodium restriction. The provision of education to patients can increase their behavioral intention through improving their attitudes, perceived behavioral control, and subjective norm, which can eventually bring about behavioral changes (20). In line with our results, a study reported that education improved the medication adherence and clinical outcomes including the quality of life and the first occurrence of cardiac complications in patients with CHF compared with the control group (25). A study by Villarruel et al., (26) investigated the effect of the education intervention on improving self-management and reducing hospitalization. It showed that providing appropriate education to patients increased self-management in the area of sodium restriction and reduced hospitalization due to heart failure in the 30-day period after hospital discharge. According to the results of this study, patients in the intervention group had a more positive attitude towards the sodium restriction compared with the control group and baseline. A study determined that 6 weeks after the intervention, a significant increase was reported in patients’ adherence attitude to the dietary sodium restriction in patients with CHF compared with the control group. However, 6 months later, such a difference was not statistically significant despite the high level of attitude (27). In a quasi-experimental study, education improved the awareness, attitude, and adherence to self-care behaviors in patients with CHF. However, education was effective only in patients without depression. Therefore, the need for the consideration of psychological problems before education was emphasized (28). Similar to this study, Welsh et al. (2013) did not assess psychological problems among patients. In the present study, the mean score of the subjective norm in the intervention group showed a significant increase 6 and 12 weeks after the education program compared with the control group and baseline. Nevertheless, in the study, no differences were reported between the intervention and control groups in terms of the scores of the subjective norm before, 6 weeks, and 6 months after education (29). Such differences can be related to a larger sample size, the presence of a family member in the education program, or the short 12-week follow up compared with the Welsh’s study. Since the diet adherence takes place in the context of the family and the majority of patients need other family members’ help for cooking, the family involvement in the education program can improve an adherence to the diet. Nonetheless, more studies should be carried out to show the impact of the family involvement in the education program. A study indicated that the adherence to the low sodium diet was difficult without the family’s continuous support. They showed that patients living in families who followed a low-sodium diet adhered to the dietary restriction of sodium 1.6 times more than those in families that did not follow a low-sodium diet (30). Similarly, the results of a study showed that the sodium intake in patients with CHF who received education with their families was lower compared with those patients who received education without the participation of their families (31). The results of this study showed that the mean scores of the perceived behavioral control in the intervention group, 6 and 12 weeks after the intervention, reduced significantly compared with the control group and baseline. In a study, barriers to the adherence to a low sodium diet were a lack of awareness, difficulty in finding low salt foods in restaurants, and disliking the taste of low-salt foods (32). Therefore, healthcare staff and family members who receive educational and motivational programs play an important role in increasing patients’ willingness and ability to adhere to the low sodium diet. ‎Education can reduce barriers to behavior changes and increase perceived behavioral control (27). However, Welsh et al. (2013) indicated that no statistically significant differences between the intervention and control groups were found in terms of the scores of perceived behavioral control before, 6 weeks, and 6 months after the education program. Probable reasons for such differences were the methodologies of the studies and the family participation. The sodium intake in the patients before the education program was about 3200 mg per day. Food can be under the influence of the individual’s culture, economy, and environment (33). No studies were conducted on the food culture in patients living in Yazd province. Nonetheless, the average sodium intake of the healthy individuals who were referred to clinics in Yazd was 3700 mg (34), which was very high. In a study, the average 24 - hour excretion of sodium was 3827 mg (SD = 1436) (35). Basuray et al., (36) measured the sodium intake of patients with heart failure undergoing education on the sodium restriction to less than 2 gr based on a 24-hour urine sample. The patients received 3.15 ± 1.58 gr sodium and only 23% of the patients ahdered to the diet with a sodium restriction. Only 1/3 of patients with heart failure in class 2 and 3 of the New York Heart Association consumed less than 2 gr sodium per day (37). With regard to cultural and ethnic differences, there was a need to carry out similar studies on different populations to measure the sodium intake and examine the effect of education programs. Moreover, in this study, the education program led to a significant reduction in the amount of urinary sodium in the intervention group compared with the control group, which was in line with the findings of a previous study (38). ‎According to the current study, in the intervention group, the amount of sodium intake 6 weeks after the education program was less than that 12 weeks later. This difference was due to less changes in the adherence intention 12 weeks later compared to 6 weeks later. Also, in the current study, patients were followed up for 6 weeks. Regarding the need for continuing the education program for internalizing the sodium-restricted diet, reminders using telephone follow-ups or virtual methods can be used. However, more studies are required to be carried out. Strategies should be made to devise plans with the aim to examine the suitable time for patient education to maintain an adherence to a low sodium diet. Welsh et al. (29) showed that no statistically significant difference between the 2 groups were reported in terms of the sodium intake 6 weeks after the education program. However, 6 months later, a statistically significant difference in the sodium intake was reported between the groups. The difference in the results of these studies can be attributed to differences in their methodologies. Some limitations may affect the generalizability of the findings. For instance, a convenience sampling method was used. Also, the patients with CHF were literate, had the EF less than 35%, and lived with a family member. The patient was not followed up in a weekly manner. In this study, a patients visit with the monthly period and also paying the travel costs were used to increase the patients cooperation. Furthermore, the researcher collected 24 urine samples from the patients to prevent samples’ loss. Since the patients were literate people living in an urban area, the generalizability of patients with different characteristics and different contexts needs further studies. In this study, the education program improved the adherence intention to the dietary sodium restriction and reduced the sodium intake in patients with CHF. The educational role of nurses in the healthcare system is the reduction of patients’ sodium intake. It is recommended to devise strategies for encouraging nurses to educate patients with CHF with regard to the modification of the life style and self-care behavior improvements. It is suggested to investigate the effect of similar educational interventions on the patients’ adherence to self-care in various health-related aspects. Moreover, it is necessary to evaluate the effect of this education program on clinical other outcomes including the quality of life, readmission, and cost of healthcare. This article was based a thesis submitted to the School of Nursing and Midwifery, Iran University of Medical Science. The authors would like to show their gratitude to the staff and faculty authorities of the School of Nursing and Midwifery at Iran University of Medical Sciences. We are also immensely grateful to the officials and staff at Mohammad Sadegh Afshar’s training, research center, and patients who participated in this study. Authors’ Contribution: Tahereh Najafi Ghezeljeh, Hamid Haghani, Kazem Akhondzadeh Data analysis, Kazem Akhondzadeh Data collection, Tahereh Najafi Ghezeljeh Critical revision of the manuscript, Tahereh Najafi Ghezeljeh, Hamid Haghani, Kazem Akhondzadeh Drafting of the manuscript. Financial Disclosure: Authors have nothing to disclose. Funding / Support: Funding support was provided by School of Nursing and Midwifery, Iran University of Medical Sciences. 1. Lozano R, Naghavi M, Foreman K, Lim S, Shibuya K, Aboyans V. Global and regional mortality from 235 causes of death for 20 age groups in 1990 and 2010: a systematic analysis for the Global Burden of Disease Study 2010. Lancet London England. 2012;380(9859):2095-128. 2. Ford ES, Capewell S. Proportion of the decline in cardiovascular mortality disease due to prevention versus treatment: public health versus clinical care. Annu Rev Public Health. 2011;32:5-22. doi: 10.1146/annurev-publhealth-031210-101211. [PubMed: 21417752]. 3. Lloyd-Jones D, Adams RJ, Brown TM, Carnethon M, Dai S, De Simone G, et al. Heart disease and stroke statistics--2010 update: a report from the American Heart Association. Circulation. 2010;121(7):e46-e215. doi: 10.1161/CIRCULATIONAHA.109.192667. [PubMed: 20019324]. 4. Mozaffarian D, Benjamin EJ, Go AS, Arnett DK, Blaha MJ, Cushman M, et al. Heart Disease and Stroke Statistics-2016 Update: A Report From the American Heart Association. Circulation. 2016;133(4):e38-360. doi: 10.1161/CIR.0000000000000350. [PubMed: 26673558]. 5. Kohi F, Salehinia H, Mohammadian-Hafshejani A. Trends in mortality from cardiovascular disease in Iran from 2006-2010. J Sabzevar Univ Med Sci. 2015;22(4):630-8. 6. Smeltzer S, Bare B, Hinkle J, Cheever K. Brunner and Suddarth's textbook of medical surgical nursing. 13th ed ed. Philadelphia: Wolters Kluwer health/ Lippincott Williams and Wilkins; 2014. 7. Cowie MR, Anker SD, Cleland JGF, Felker GM, Filippatos G, Jaarsma T, et al. Improving care for patients with acute heart failure: before, during and after hospitalization. ESC Heart Fail. 2014;1(2):110-45. doi: 10.1002/ehf2.12021. [PubMed: 28834628]. 8. Ditewig JB, Blok H, Havers J, van Veenendaal H. Effectiveness of self-management interventions on mortality, hospital readmissions, chronic heart failure hospitalization rate and quality of life in patients with chronic heart failure: a systematic review. Patient Educ Couns. 2010;78(3):297-315. doi: 10.1016/j.pec.2010.01.016. [PubMed: 20202778]. 9. Rajabi M, Ramezani M. The study of electrocardiography, cardiac enzymes, blood sugar and serum electrolytes in hospitalized patients with decompensate heart failure. Daneshvar. 2008;16(79):39-44. 10. Whelton PK, Appel LJ, Sacco RL, Anderson CA, Antman EM, Campbell N, et al. Sodium, blood pressure, and cardiovascular disease: further evidence supporting the American Heart Association sodium reduction recommendations. Circulation. 2012;126(24):2880-9. doi: 10.1161/CIR.0b013e318279acbf. [PubMed: 23124030]. 11. Appel LJ, Frohlich ED, Hall JE, Pearson TA, Sacco RL, Seals DR, et al. The importance of population-wide sodium reduction as a means to prevent cardiovascular disease and stroke: a call to action from the American Heart Association. Circulation. 2011;123(10):1138-43. doi: 10.1161/CIR.0b013e31820d0793. [PubMed: 21233236]. 12. van der Wal MH, van Veldhuisen DJ, Veeger NJ, Rutten FH, Jaarsma T. Compliance with non-pharmacological recommendations and outcome in heart failure patients. Eur Heart J. 2010;31(12):1486-93. doi: 10.1093/eurheartj/ehq091. [PubMed: 20436049]. 13. Barati M, Allahverdipour H, Moeini B, Farhadi Nasab A, Mahjub H, Jalilian F. Assertiveness skills training efficiency on college students' persuasive subjective norms against substance abuse. Scientific J Hamadan Univ Med Sci. 2011;18(3):40-9. 14. Artinian NT, Fletcher GF, Mozaffarian D, Kris-Etherton P, Van Horn L, Lichtenstein AH, et al. Interventions to promote physical activity and dietary lifestyle changes for cardiovascular risk factor reduction in adults: a scientific statement from the American Heart Association. Circulation. 2010;122(4):406-41. doi: 10.1161/CIR.0b013e3181e8edf1. [PubMed: 20625115]. 15. Shahriari M, Ahmadi M, Babaee S, Mehrabi T, Sadeghi M. Effects of a family support program on self-care behaviors in patients with congestive heart failure. Iran J Nurs Midwifery Res. 2013;18(2):152-7. [PubMed: 23983746]. 16. Ponikowski P, Anker SD, AlHabib KF, Cowie MR, Force TL, Hu S, et al. Heart failure: preventing disease and death worldwide. ESC Heart Fail. 2014;1(1):4-25. doi: 10.1002/ehf2.12005. [PubMed: 28834669]. 17. Ortega RM, Lopez-Sobaler AM, Ballesteros JM, Perez-Farinos N, Rodriguez-Rodriguez E, Aparicio A, et al. Estimation of salt intake by 24 h urinary sodium excretion in a representative sample of Spanish adults. Br J Nutr. 2011;105(5):787-94. doi: 10.1017/S000711451000423X. [PubMed: 20969815]. 18. Smith-Spangler CM, Juusola JL, Enns EA, Owens DK, Garber AM. Population strategies to decrease sodium intake and the burden of cardiovascular disease: a cost-effectiveness analysis. Ann Intern Med. 2010;152(8):481-7. W170-3. doi: 10.7326/0003-4819-152-8-201004200-00212. [PubMed: 20194225]. 19. Dickstein K, Cohen-Solal A, Filippatos G, McMurray JJ, Ponikowski P, Poole-Wilson PA, et al. ESC Guidelines for the diagnosis and treatment of acute and chronic heart failure 2008: the Task Force for the Diagnosis and Treatment of Acute and Chronic Heart Failure 2008 of the European Society of Cardiology. Developed in collaboration with the Heart Failure Association of the ESC (HFA) and endorsed by the European Society of Intensive Care Medicine (ESICM). Eur Heart J. 2008;29(19):2388-442. doi: 10.1093/eurheartj/ehn309. [PubMed: 18799522]. 20. Ajzen I, Fishbein M. Understanding attitudes and predicting social behavior. Englewood, New Jersey: Prentice Hall; 1980. 21. Glanz K, Rimer BK, Lewis FM. Health behavior and health education: Theory, research and practice. 4th ed ed. San Francisco, calif: Jossey- Bass; 2008. 22. McDermott MS, Oliver M, Simnadis T, Beck EJ, Coltman T, Iverson D, et al. The Theory of Planned Behaviour and dietary patterns: A systematic review and meta-analysis. Prev Med. 2015;81:150-6. doi: 10.1016/j.ypmed.2015.08.020. [PubMed: 26348455]. 23. Lino S, Marshak HH, Herring RP, Belliard JC, Hilliard C, Campbell D, et al. Using the theory of planned behavior to explore attitudes and beliefs about dietary supplements among HIV-positive Black women. Complement Ther Med. 2014;22(2):400-8. doi: 10.1016/j.ctim.2014.03.002. [PubMed: 24731912]. 24. Bentley B, Lennie TA, Biddle M, Chung ML, Moser DK. Demonstration of psychometric soundness of the Dietary Sodium Restriction Questionnaire in patients with heart failure. Heart Lung. 2009;38(2):121-8. doi: 10.1016/j.hrtlng.2008.05.006. [PubMed: 19254630]. 25. Wu JR, Corley DJ, Lennie TA, Moser DK. 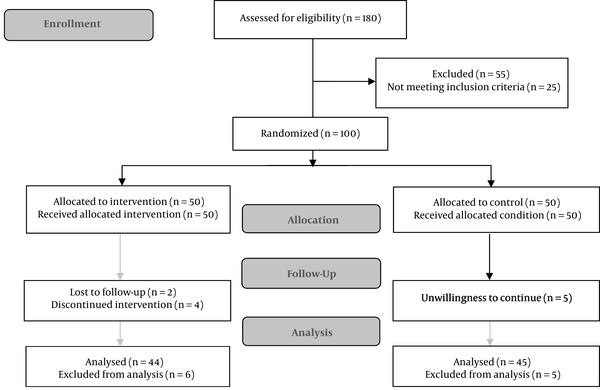 Effect of a medication-taking behavior feedback theory-based intervention on outcomes in patients with heart failure. J Card Fail. 2012;18(1):1-9. doi: 10.1016/j.cardfail.2011.09.006. [PubMed: 22196835]. 26. Villarruel ML. The Effect of Heart Failure Education on Reducing Readmissions. 2013. 27. Welsh D, Marcinek R, Abshire D, Lennie TA, Biddle M, Bentley B, et al. Theory-based low-sodium diet education for heart failure patients. Home Healthc Nurse. 2010;28(7):432-41. quiz 441-3. doi: 10.1097/NHH.0b013e3181e324e0. [PubMed: 20592543]. 28. Navidian A, Yaghoubinia F, Ganjali A, Khoshsimaee S. The Effect of Self-Care Education on the Awareness, Attitude, and Adherence to Self-Care Behaviors in Hospitalized Patients Due to Heart Failure with and without Depression. PLoS One. 2015;10(6). e0130973. doi: 10.1371/journal.pone.0130973. [PubMed: 26091101]. 29. Welsh D, Lennie TA, Marcinek R, Biddle MJ, Abshire D, Bentley B, et al. Low-sodium diet self-management intervention in heart failure: pilot study results. Eur J Cardiovasc Nurs. 2013;12(1):87-95. doi: 10.1177/1474515111435604. [PubMed: 22492785]. 30. Chung ML, Lennie TA, Mudd-Martin G, Moser DK. Adherence to a low-sodium diet in patients with heart failure is best when family members also follow the diet: a multicenter observational study. J Cardiovasc Nurs. 2015;30(1):44-50. doi: 10.1097/JCN.0000000000000089. [PubMed: 24165698]. 31. Dunbar SB, Clark PC, Reilly CM, Gary RA, Smith A, McCarty F, et al. A trial of family partnership and education interventions in heart failure. J Card Fail. 2013;19(12):829-41. doi: 10.1016/j.cardfail.2013.10.007. [PubMed: 24331203]. 32. Heo S, Lennie TA, Moser DK, Okoli C. Heart failure patients' perceptions on nutrition and dietary adherence. Eur J Cardiovasc Nurs. 2009;8(5):323-8. doi: 10.1016/j.ejcnurse.2009.05.005. [PubMed: 19589729]. 33. Majowicz SE, Meyer SB, Kirkpatrick SI, Graham JL, Shaikh A, Elliott SJ, et al. Food, health, and complexity: towards a conceptual understanding to guide collaborative public health action. BMC Public Health. 2016;16:487. doi: 10.1186/s12889-016-3142-6. [PubMed: 27277001]. 34. Motlagh Z, Mazloomy S, Mozaffari Khosravi H, Morovatisharifabadi M, Askarshahi M. Salt intake among women refer to medical health centers, Yazd, Iran. J Shaheed Sadoughi Univ Med Sci. 2011;19(4):550-60. 35. Son YJ, Lee Y, Song EK. Adherence to a sodium-restricted diet is associated with lower symptom burden and longer cardiac event-free survival in patients with heart failure. J Clin Nurs. 2011;20(21-22):3029-38. doi: 10.1111/j.1365-2702.2011.03755.x. [PubMed: 21707808]. 36. Basuray A, Dolansky M, Josephson R, Sattar A, Grady EM, Vehovec A, et al. Dietary sodium adherence is poor in chronic heart failure patients. J Card Fail. 2015;21(4):323-9. doi: 10.1016/j.cardfail.2014.12.016. [PubMed: 25576680]. 37. Frediani JK, Reilly CM, Higgins M, Clark PC, Gary RA, Dunbar SB. Quality and adequacy of dietary intake in a southern urban heart failure population. J Cardiovasc Nurs. 2013;28(2):119-28. doi: 10.1097/JCN.0b013e318242279e. [PubMed: 22343212]. 38. Colin Ramirez E, Castillo Martinez L, Orea Tejeda A, Rebollar Gonzalez V, Narvaez David R, Asensio Lafuente E. Effects of a nutritional intervention on body composition, clinical status, and quality of life in patients with heart failure. Nutrition. 2004;20(10):890-5. doi: 10.1016/j.nut.2004.06.010. [PubMed: 15474877].